I must have had a stressful week at work because this is my second post about comfort food with rice. 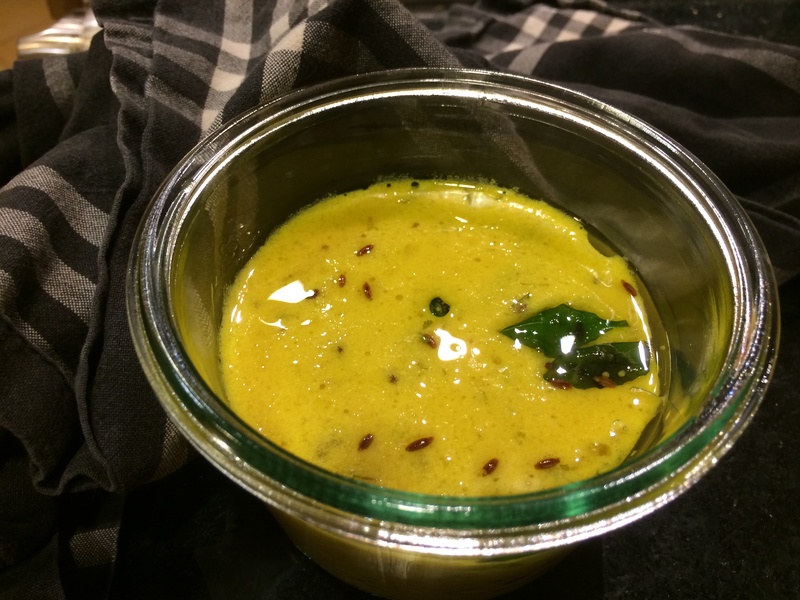 It is probably foolhardy to attempt a definition, but ‘kadhi’ is a boiled liquid of yogurt and chickpea flour that is made in various ways all over India. It combines the sourness of yogurt with the body added by the chickpea flour, and some sweetness, usually. The result is so soothing that the aromas can bring the most hardened criminal rushing back home to his mother’s kitchen. 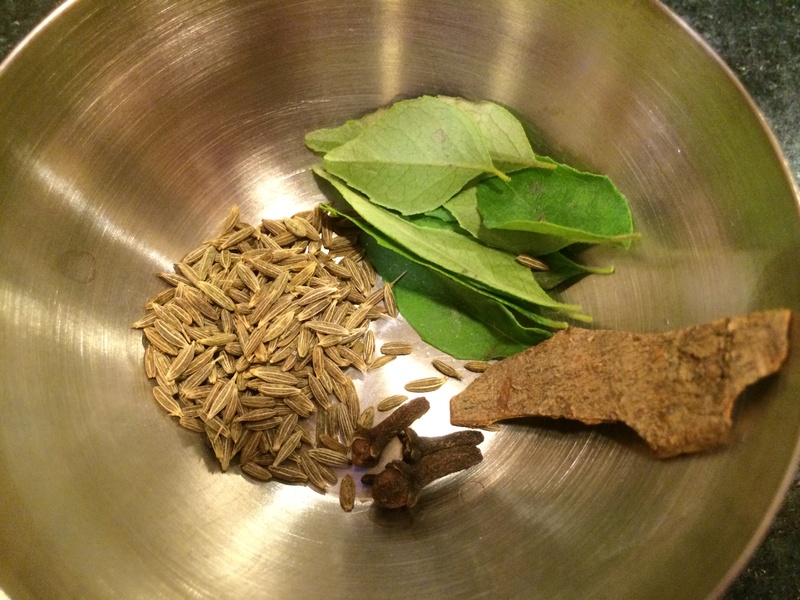 While I’m not suggesting you use this for crime management anytime soon, it is certainly one of the simplest Indian recipes to put together for non-Indian cooks. Now every region of India, even every micro-region, has its own version. But the salience of each of the few ingredients in this recipe is such that each cook’s kadhi will be a little different. 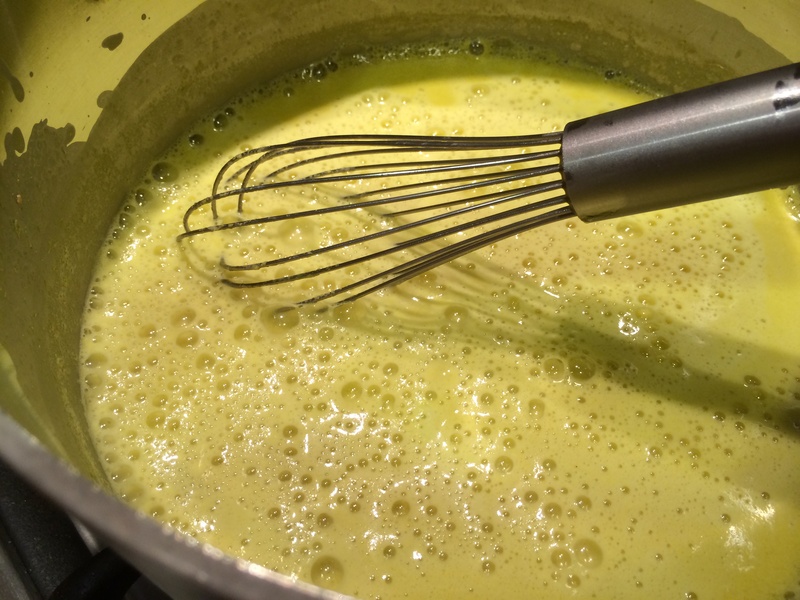 The number of tablespoons of chickpea flour used makes a difference, as does the sourness of the yogurt you started with; also how much chili heat has been added or how much sugar. 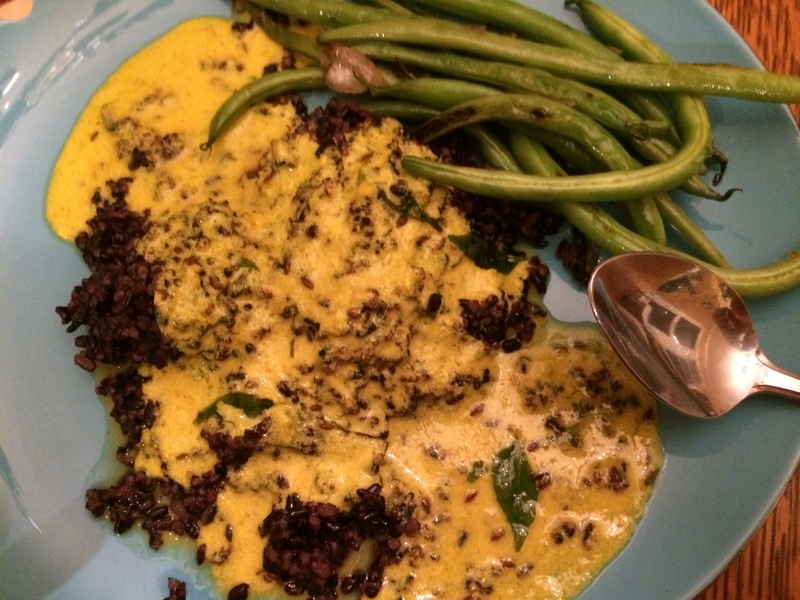 I grew up eating lunch at Gujarati friends’ houses, so I have a special place in my heart for the Gujarati kadhi. It goes well with soft white rice or creamy khichdis. But we had it with Bhutanese black forbidden rice and green beans on the side. This version is from Taste of Gujarat by Nita Mehta. 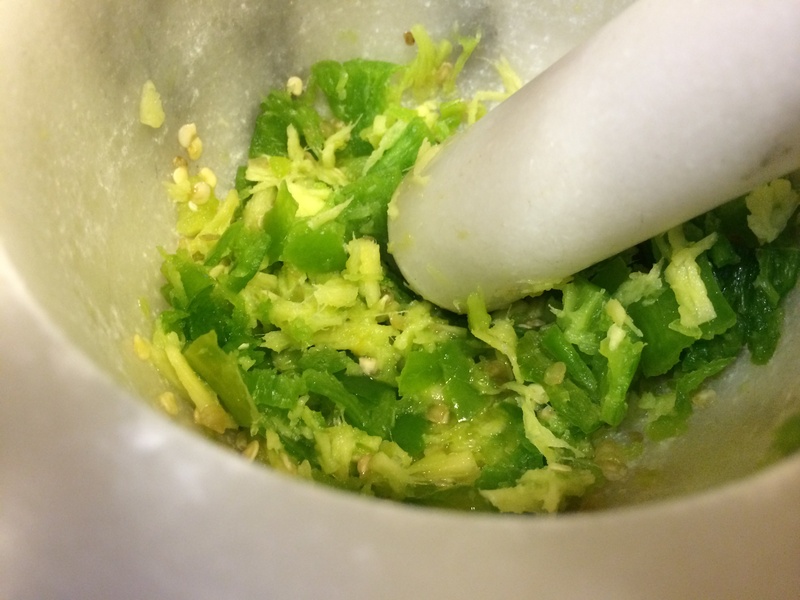 Make a paste of the ginger and chili in a mortar and pestle. 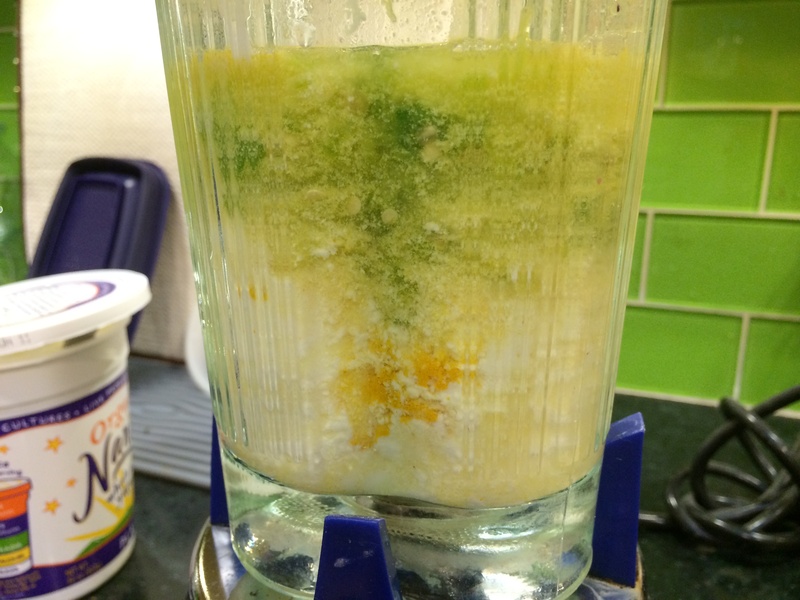 In a blender, put in the yogurt, the chickpea flour, turmeric, salt, the paste from above, and 1 cup water. Give it a whirl to combine. Put this soup in a pot and bring it to a boil. At this point you can add the sweetener. Let it simmer, uncovered, for about 15 minutes. 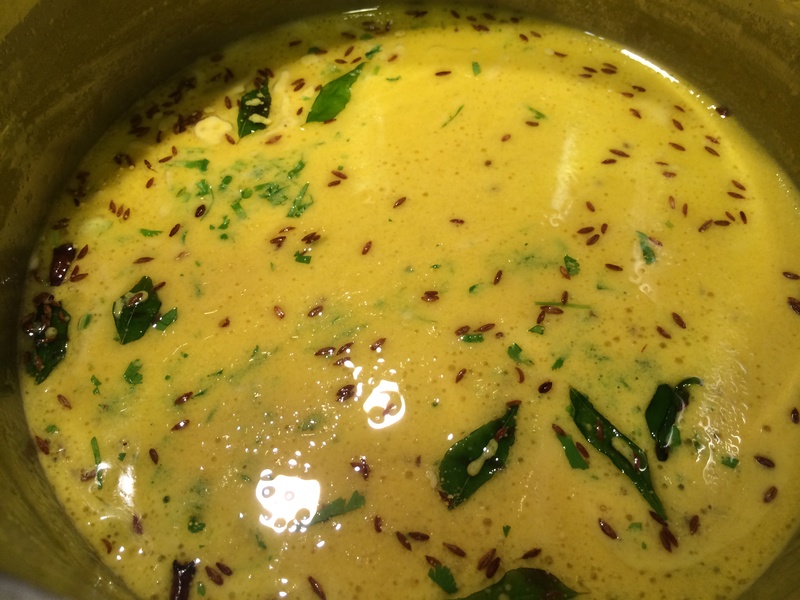 Now the kadhi is more-or-less done, all that is left is the tempering. Turn it off and cover it. Heat the ghee in a small pan. When fully melted and shimmering, put in the cinnamon and cloves; when they sizzle the cumin seeds; when that sizzles the curry leaves. They will shrivel up quickly. 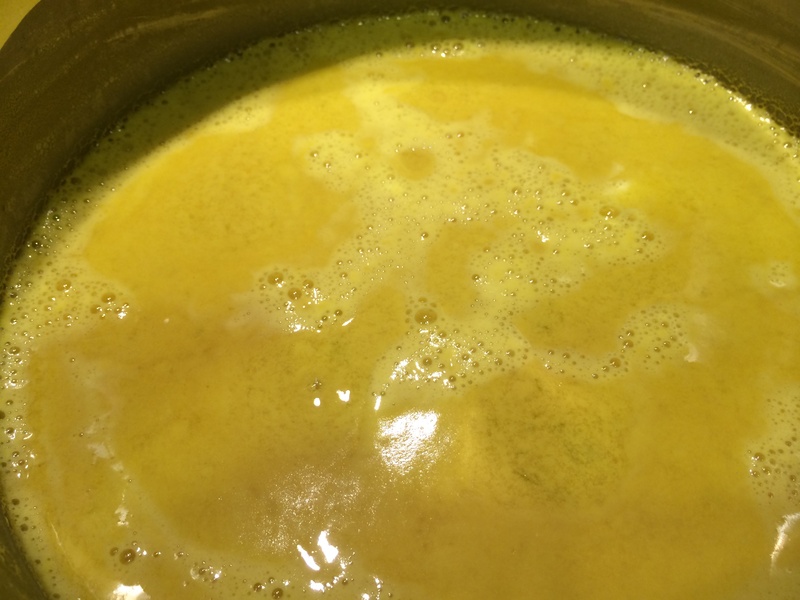 Turn off the heat and pour the ghee into the kadhi. 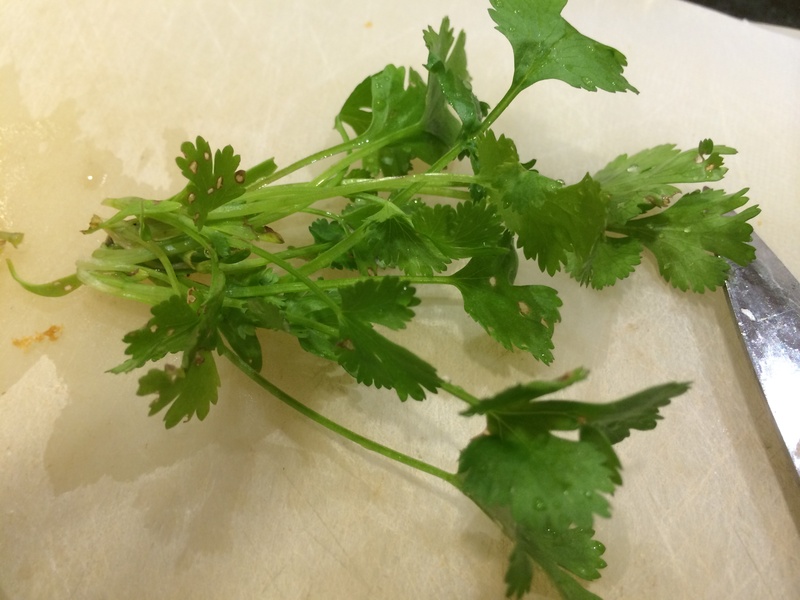 Also add the minced cilantro (this does not need cooking). Stir nicely and enjoy with rice. What a fabulously healthy and tasty recipe – this looks gorgous! Yes, it certainly is healthy and pretty simple to make. I neglected to mention that it can also be eaten as a soup. This dish was the bane of my late teens/early twenties; I hated the smell, I thought the colour was appalling and there was no way that khichri was going near my mouth either. I was a size 4-6 and I was staying that way, so pass me the salad. If I could have had a tantrum, I would have. Fast forward a few years. I’ve been married a few months, cannot cook to save my life and my husband’s best friend (an Ismaili) is married to a French woman who left us open mouthed at the food she would make. An invitation to dinner at theirs meant not eating all day so that I could indulge in 3 delicious courses full of wine, cream and butter plus the cheese board. So, when a call came to go round for dinner that Friday, I duly starved myself and put on my loosest trousers and off we went. She smiled and said that Azad had decided the menu that evening and produced – Kadhi and Khichri. Oh. My. God. My nemesis. I couldn’t throw a tantrum, I was an MARRIED WOMAN now and I was bloody starving as well. I asked for a really small portion, all the while thinking about what we had in that I could make to eat when we got home – which was probably nada; gingerly dipped my spoon in the bowl, stopped breathing and reluctantly forced it into my mouth. OHMYGOD it was delicious!! I had three helpings and when we got in the car later, I had to make my husband swear to never tell my mother that I had not only eaten Kadhi but had had THREE helpings! Thanks for this recipe Aneela – I shall be making it next week! Just don’t tell my mum!! Selma, what a great story. If only your grown-up self could knock some sense into my 8-year-old. I think she would totally relate with your childhood feelings about kadhi. Who knows when she will get to the next phase — perhaps I will have to wait for her to become a food-blogger! I’m so glad that you finally saw the light! Aneela, I was an absolute nightmare as a child/teen/young adult. I had eczema and asthma that my mother was convinced was triggered by food so the list of what I couldn’t eat grew daily. Then I had a small problem with body image so hardly ate anything. Thank goodness that is all behind me! (Literally. Kim Kardashian and I are twins from behind!) It wasn’t until I got married that I developed a savoury palate. Of course your daughter will grow out of it – maybe she could start blogging now! It really is…and don’t stress about if if you can’t find any particular ingredient. The only essentials really are the yogurt and the chickpea flour. Powdered spices can work as a substitute. But whatever you do — don’t use garlic. I tried it in this recipe once and was miserable about the results.